This Scale Aircraft Conversions set for the new Kitty Hawk 1/32 F-5E Tiger II. 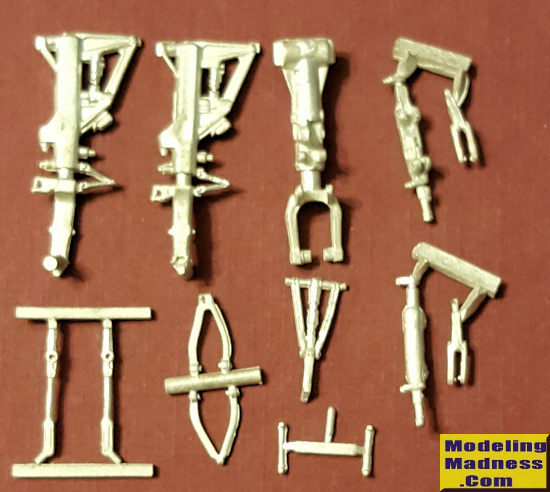 This set is considerably more complex than that of the Hasegawa kit and includes numerous additional parts to go with the main gear, which include main gear door brackets. The nose gear has a very solid let with its retraction brace. These are direct replacements for the kit parts and are nicely molded. This set should also be good for the F-5E Tigereye boxing and perhaps also for the F-5F when it is released.